Packages to Fernando de Noronha and Recife, Brazil. Recife is the main gateway to Fernando de Noronha and a great place to include on your Brazilian itinerary when visiting the island. Get the tip from our local experts, learn about the package options to Noronha before you go. 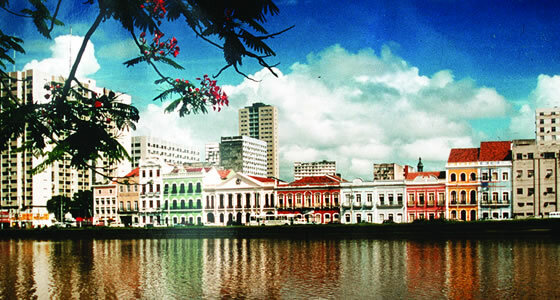 Recife is the capital of the state of Pernambuco and sits on the northeast coast of Brazil. The city was originally settled by the Dutch. Today it is one of the largest cities in the region with over 4 million residents in the metropolitan area. Recife has a tropical climate with a dry season from September to March and a rainy season from April through August. Average yearly temperature is around 80 degrees F. The city sits just above sea level amidst rivers, islands and canals. It is divided into Centro, Zona Sul, Zona Oeste and Zona Norte districts. Centro has many neighborhoods arranged over a few islands. It has the most historic buildings in the city. Zona Sul is modern and made for tourists. This is where the most beautiful beaches are located. Zona Oeste retains a small portion of the Atlantic Forest and Zona Norte is known for its residential areas as well as its bars and parks. Recife is famous for its beaches. Boa Viagem Beach is well known as an urban beach with some of the softest white sand. There is a wide avenue along the beach filled with vendors selling coconut water, food, and souvenirs. Piedade Beach is best known for its surfing. Other beaches include Sao Jose de Coroa Grande and Carne de Vaca. There are several historical sites in the city including several churches such as Convento Franciscano de Santo Antonio, a convent that houses the Golden Chapel and Sao Pedro dos Clerigos a blend of baroque, rococo and neoclassical designs. Several museums throughout the city beckon to visitors seeking to educate themselves about the city and its people. These museums include Ricardo Brennand Institute that contains Brazilian artifacts and Museum of Northeastern Man that focuses on the native tribes of the area. There are several events and activities to enjoy in the city. Carnival is one of the most exciting times of year. Street shows and parades occur round the clock and residents dance to the bumba-meu-boi and caboclinho. Dance rehearsals in preparation for Carnival occur throughout the year. Tourists can also enjoy catamaran rides along the coast. Boats take scuba divers out to shipwreck park with more than 100 sunken ships to explore. Sports lovers can join in a game of volleyball or footvolley on Boa Viagem beach.There is also plenty of shopping for regional crafts at Casa de Cultura and Mercado do Sao Jose. Or, tourists can enjoy shopping at some of the largest shopping centers in Brazil including Shopping Center Recife, Shopping Center Tacaruna and Paco Alfandega with its popular nightclub and exotic restaurants.